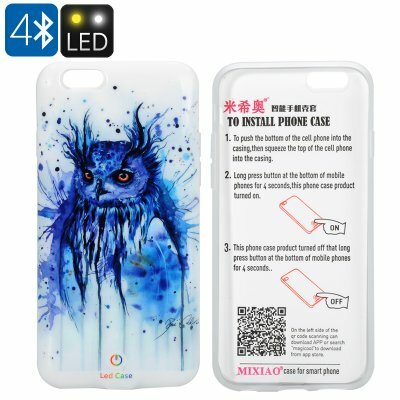 Successfully Added LED iPhone 6/6s Case - Owl Design, 5 LEDs, Free App, 300mAh Battery, Call Notification, 10 Hours Usage Time to your Shopping Cart. For wise souls and nature lovers alike this iPhone 6 case fits your cell iPhone 6 perfectly and brings great protection from drops, dirt and scratches. The case features a prominent owl, a symbol of Athena, the goddess of wisdom and strategy. This guardian of acropolis is a totem of knowledge that and with 5 built in LEDs the case can help bring inspiration as well as guidance, lighting up to your musical beats or notifying you of incoming calls. A free iPhone app provides full control of the 5 built in LEDs and with a 300mAh battery can bring you 10 hours of usage. For the wisest of spirits and nature lovers the world over this iphone 6 case is more than just protection for your phone.